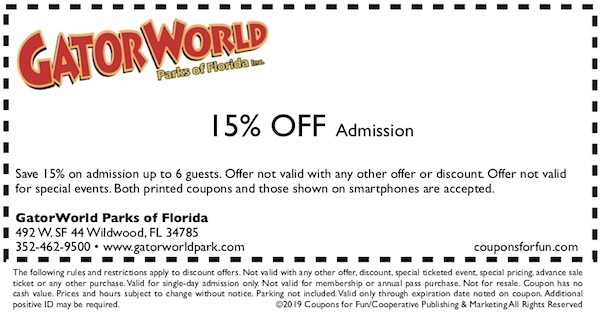 GatorWorld Parks of Florida in Wildwood, Florida - Get savings coupon! GatorWorld is a drive-through attraction providing views of monster gators lounging in roadside pools. At the end, you can get out and see, feed and hold some gators. The park is very kid friendly. Our staff is welcoming, friendly and knowledgeable about the animals. We offer our guests no rushing, no lines and personal attention from our staff. We have lots of farm animals in our petting zoo and an awesome Bunny Barn with many soft baby bunnies to pet.